Media captionYvette Cooper: "We're in a very dangerous situation"
A cross-party group of MPs has put forward a bill to prevent a no-deal Brexit in 10 days' time. If passed into law, the bill would require the PM to ask for an extension of Article 50 - which mandates the UK's exit from the EU - beyond the current 12 April deadline. Labour MP Yvette Cooper presented the bill - which supporters hope they can pass through the Commons in one day. The prime minister is expected to make a statement shortly. It comes after the cabinet, which remains split over Brexit, met for eight hours in No 10. The BBC's John Pienaar said Theresa May's ministers considered plans to "ramp up" no-deal Brexit preparations and a snap general election was also discussed. Ms Cooper's bill would make it UK law for the PM to ask for an extension to prevent a no-deal, but it would be up to the EU to grant it - or not. In March, MPs voted against leaving the EU without a deal, but it was not legally binding. 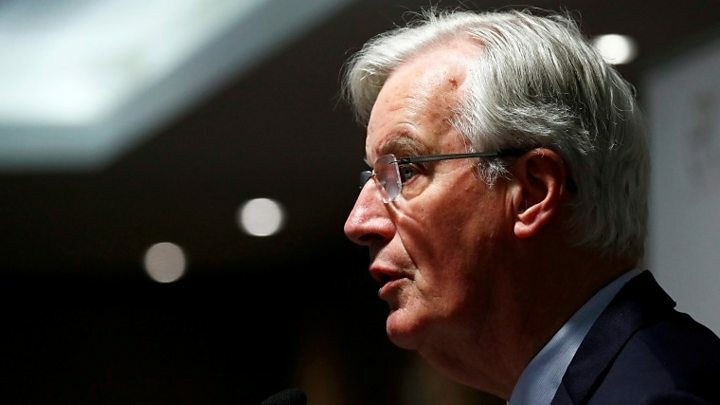 Meanwhile, the EU's chief negotiator has said a no-deal Brexit is now more likely but can still be avoided. 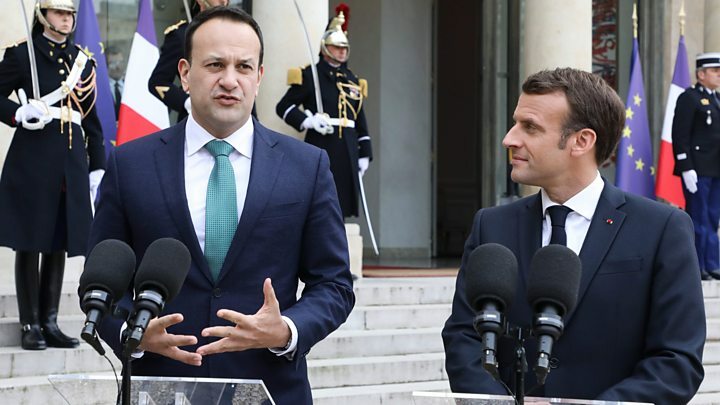 France's President Emmanuel Macron and Irish Taoiseach Leo Varadkar are meeting in Paris to discuss the impact of Brexit. Mr Varadkar said the UK was "consumed by Brexit", but the EU should not be. He said the EU "needs to be open" about any proposals the UK brings, including a longer extension, and they will do what they can to "assist". But he added: "We gave the UK some time, some space and some opportunity to come up with a way forward... [but] as things stand, they will leave on 12 April without a deal." Tory MP Sir Oliver Letwin, who supports Ms Cooper's bill, said: "This is a last-ditch attempt to prevent our country being exposed to the risks inherent in a no-deal exit. "We realise this is difficult. But it is definitely worth trying." Ms Cooper said the UK was "in a very dangerous situation" and MPs "have a responsibility to make sure we don't end up with a catastrophic no deal". Speaking to BBC Radio 4's World At One, she added: "We have been attempting to squeeze into just a couple of days a process that really should have been happening for the last two years - a process of trying to build a consensus around the best way forward. "It is what the prime minister should be doing. It is the prime minister's responsibility to ensure we don't leave the country less safe." Why is this bill unusual? Normally the government chooses which bills to present to Parliament in order for them to become law. But - much to the government's disapproval - MPs voted to allow backbenchers to take charge of business in the Commons on Wednesday. This gives backbenchers the opportunity to table their own bills, such as this one from Yvette Cooper. A copy of the bill shows that they want to push it through the commons in one day. As the backbenchers will be in charge, they will also be able to vote to set aside more time on another day, if they need to complete the process or hold further indicative votes. However, the bill would also have to be agreed by the House of Lords and receive Royal Assent before it became law - which if the Commons agrees it on Wednesday, could happen as soon as Thursday. But Speaker John Bercow said that, while it was "an unusual state of affairs", it was "not as unprecedented as he supposes" - citing recent bills on Northern Ireland that have been passed at the same speed. In the latest round of indicative votes on Monday, MPs voted on four alternatives to the PM's withdrawal deal, but none gained a majority. MPs rejected a customs union with the EU by three votes. A motion for another referendum got the most votes in favour, but still lost. The votes were not legally binding, but they had been billed as the moment when Parliament might finally compromise. The Independent MP Chris Leslie tweeted that MPs would be seeking more time for indicative votes to take place on Monday. Liberal Democrat MP Norman Lamb said he is considering resigning the whip after his party refused to back proposals for a customs union and Common Market 2.0 on Monday. He told BBC News: "If you are seen to be unreasonable, not engaging to find solutions, I don't think it is very attractive to the people." Earlier, Mr Barnier said: "No deal was never our desire or intended scenario but the EU 27 is now prepared. It becomes day after day more likely."